Because of its nature as a sequel, spoilers for all Sakura Wars games up to this one, as well as Sakura Wars: The Movie and the OVAs preceding it, will be left unmarked. You Have Been Warned! Sakura Wars V: So Long, My Love is the fifth main installment of the Sakura Wars series, the last to be developed by Red Entertainment and the only one on the PlayStation 2 and the Nintendo Wii (as well as the first to be officially released outside Japan). Picking up one year after the events of Sakura Wars 4: Fall in Love, Maidens, Navy Lieutenant Shinjiro Taiga, an in-training samurai from Tokyo, is summoned to New York to join the New York Combat Revue Star Division, a squad of vigilantes who, behind the disguise of a musical troupe, use their Transforming Mecha to protect New York from the threat of mysterious invading robots animated by a force known as "Dark Pneuma". The game focuses on Shinjiro acquainting himself with his new home, opening up to his teammates, and leading the Star Division against the Dark Pneuma's forces. Like the rest of the series, So Long, My Love is split between visual novel and turn-based strategy, where the actions in the former will affect the performances of each character in the latter. The game is followed by Shin Sakura Wars. Action Bomb: The Kamikaze and Floating Bomb enemy. Always Close: It doesn't matter if you break Enten's Pneuma tank (which is about to turn your allies to stone permanently) right away, or after several turns: the messages about having three or one minute left will only pop up when it reaches certain tresholds of damage, and in the following cutscene it will be destroyed as the last second ticks down. Anime Theme Song: Earth Warriors. Bloodless Carnage: No blood is seen in many scenes where it would make sense, including Shinjiro striking down Tsugarubi on foot, and getting shot through the chest by Nobunaga. Boke and Tsukkomi Routine: Dokurobo attempts to do this with Shinjiro. In the middle of their battle. If Shin takes him seriously, he gets infuriated and lampshades it. 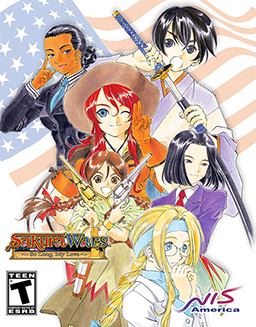 The opening of the game takes place in Tokyo, which is the setting for Sakura Wars, Sakura Wars 2 and Sakura Wars 4, as well as the film. Yuichi Kayama first appears playing a musical instrument, this time playing the ukulele. Calling Your Attacks: Everyone's special attacks. Car Fu: Cheiron's first attempt to take down Kokuryuu is smashing a chopper into her. Unfortunately, it doesn't work so well. So Long, My Love isn't the first time Jurota Kosugi's voiced Oda Nobunaga. Hilariously enough, the game brings back Naoya Uchida, who played Tetsuma Shinguji in the Sakura Wars TV adaptation, as Michael Sunnyside. Bonus points for Tetsuma and Sunnyside being the uncles of their respective characters, Sakura and Diana Caprice. The game also brings back a few actors from the film's English dub. Dave Wittenberg, who played Ichiro Ogami in this game and the film, also plays Michael Sunnyside. Liam O'Brien, Kotone Seiryuin's VA in the film, voices Tsugarubi. Philece Sampler and Karen Strassman, who voiced Tsubaki Takamura and Kasumi Fujii, return as Yumedono and Diana Caprice. A Child Shall Lead Them: Shin's colleagues initially make fun of this trope when he gets promoted to Captain, in spite of Shin being actually 19 years old. Christmas Episode: Chapters 7 and 8 take place between Christmas Eve and New Year's Eve. Cognizant Limbs: The point of every boss fight is to figure out the order to take them out in to keep the team alive. Many of them in the Extra Chapter, which involve seeing cutscenes, Super Moves, and photos. In the main game, submitting a scenery photo and buying a postcard in every chapter will unlock an exclusive photo. Colony Drop: Nobunaga's summons massive meteor, named the "Sixth Heaven", to drop upon New York. Courtroom Episode: The second half of Chapter 2 takes place at an informal outdoor court, where Shinjiro is representing the Harlemites who oppose Steam Frontier's attempted gentrification of their neighborhood, while his own teammate, famed lawyer Cheiron, is representing Steam Frontier. Dangerous Forbidden Technique: The Five-Ring Mandala can seal a demon away for several centuries, but at the cost of the life of one of its casters. Darkest Hour: The beginning of the final chapter. Nobunaga leaves Shinjiro with a nearly-fatal wound which makes him bedridden for several days, the Star Division starts falling apart without his guidance, the Sixth Sun threatens to obliterate all of New York, and Shin has just learned that the only way to seal Nobunaga again requires sacrificing his closest ally. Downer Ending: Some battles can end this way if you don't meet objectives. For example, chapter 5 may end with the demons taking the statues away or Diana, Cheiron and Rosita being permanently petrified if you fail to destroy Enten's pneuma tank in time. Failing the chapter 7 battle will result in the theater's barrier being wiped out. Dub Name Change: Some names were changed in the English translation for V, but in the English dub only. The original names are preserved in the script of the Japanese dub edition, though a typo still lists Sagiita's English name on some of her bromides, as do Plum's and Rikaritta's. Her original name is also on her office door in the English disc. While the name changes were never explained, in at least the case of Sagitta and Rikaritta, it may have had to do with both characters having names wildly inaccurate for their cultural backgrounds. Eagleland: Type 1, for the most part: America is highly idealized, but is shown to have its fair share of problems. Evil Tower of Ominousness: Azuchi Castle, which takes over most of New York in the final chapter. Evil Twin: Geminine, Gemini's unborn twin sister, combines this with Superpowered Evil Side: while not evil, per se, she is utterly ruthless. Face of a Thug: Turns out the Harlem Centaurs aren't so bad if you know them. The Mafia thugs who act as antagonists in several sidequests come to help Rosita guard the docks in the final chapter. First Girl Wins: Gemini in her ending. Not only is she the first member of the team Shinjiro meets (though the last to join), but she's even the most prominent character on the game's cover art, the only one on the game disc, and the first character to appear in the opening. Five-Token Band: The New York Combat Revue consists of two Japanese (Shinjiro and Subaru), two European/White-Americans (Gemini and Diana), an African/Black-American (Cheiron), and a Mexican (Rosita). Fun with Acronyms: Super Telekinetic Assault Robots. Gratuitous English: Constantly. Particularly annoying in the English release of Sakura Wars V because if you're playing the Japanese disc, you can actually tell when the characters are using English but the translation doesn't match. Guide Dang It! : To use the powerful Coupling Attacks, which the game gives you no clue of even existing until you explore the Playable Epilogue, you have to max out the protagonist of the chapter's affection meter, then have Shinjiro stand next to her and perform a Super Move. Even harder to get is the ultimate attack Supernova, for which you have to unlock all Coupling Attacks in a single playthrough, bring all relationships (including three hidden ones) to the maximum level, and is only usable in the last chapter. Hero Insurance: Averted. If you break too many scenery items during battles (such as fences and benches), Sunnyside will remind Shin that they have to pay for all the damage done by the Stars, and ask him to be more careful. Hold the Line: Two missions in the final chapter task you with protecting your HQ and airship respectively. Humongous Mecha: All of the bosses (except Dokurobo) have one of these. Ill Girl: Diana, who recovers as Shinjiro gradually gives her back hope. Justified by the fact that her malady is due to her weak will power letting her Pneuma compromise her body. Impaled with Extreme Prejudice: Shinjiro gets shot twice by Nobunaga in Chapter 7. With flaming arrows long several feet. Interface Spoiler: Gemini appears in your status menu from Chapter 1. She doesn't become playable until the second half of chapter 6. Jack-of-All-Stats: Shinjiro's Fujiyama-Star has good attack power, armor, and speed, and even though he only has one-on-one attacks, he can heal up to 2 allies at the same time. Japanese Ranguage: In Chapter 2, this is invoked by Shinjiro and Subaru when they pose as Japanese Tourists to fool a man from the mafia. He lampshades this, saying that they sound like walking stereotypes, and afterward, Subaru says that she feels like an idiot. Leitmotif: One for each character, which is dominant in their respective chapters and plays during their sidequests. Level-Up at Intimacy 5: The only way to power up Shinjiro's stats is to raise his rank (acting professionally on the field and finishing missions efficiently). To power up the other Stars, Shinjiro has to "motivate" (befriend) his companions in the days before the battle. Friendship values between characters also give them a chance to cancel an attack aimed at another, power up Joint attacks, and unlock additional sidequests. Macross Missile Massacre: The regular attack of the Stars in Flight Mode, which launches up to 5 missiles at a time. Rosita's Star's are smaller but in a bigger number. Sunnyside takes over an arsenal and launches a salvo of carp-shaped rockets at Azuchi Castle and the Sixth Heaven to buy the Star Division enough time to destroy them. Making a Splash: Diana's standard Attack is a water jet from syringe-shaped guns; in flight mode, she launches raindrop-shaped bombs. Also, her healing Super Moves make bubbles and rainbow appear. Meaningful Name / Theme Naming: Try to guess what animal gives the name to Shinjiro Taiga's special attacks and nicknames? Tiger. Most of the co-protagonists also have names based on signs of the Western Zodiac. The Medic: Diana. Her Star can heal several allies at the same time, and her Super Moves fully heal all allies in a wide range, but her attacks lack in power somewhat. Mighty Glacier: Cheiron's Highway-Star, appropriately to her personality. It is the slowest of the team, but has very high armor and a powerful, piercing attack. Mockbuster: The book "Gone Without The Wind" is pretty popular among girls. Non-Lethal K.O. : When a Star (except Shinjiro's) is destroyed, it is whisked out of the battle with nothing but a slight disappointment of the pilot at Shin's tactical skills. Yes, even if it was shot down from the sky, melted into a pool of otherworldly fire, or crushed beneath a meteor. Paper-Thin Disguise: Geminine's mask is just a black pair of glasses which easily exposes her identity the moment they're knocked off. Playable Epilogue: You can go around the city talking with characters and playing extra scenes after beating the final boss but before the ending. Also, the "Easy and Fun Day in N.Y." takes place after the game, and unlocks more content as you unlock the endings for more companions. Puppy Love: The relationship between Rosita and Shinjiro, both during her chapter and in the epilogue if she is chosen as his companion, drifts towards this. Quick Time Event: A staple of the Dating Sim part of the game. Some of them net you a penalty if you complete them. Ramming Always Works: Nobunaga responds to Sunnyside's missile launch by erecting a barrier around the castle. Shinjiro's answer is to just smash the Ahab through. Reincarnation Romance: It's implied that Shinjiro and the girl he chooses as his partner are the reincarnation of the Five-Ring Warriors leader and the nun who sacrifices her life who have fallen in love during the ordeal. Rule of Three: The ground-based Supermove quotes for each character features quotes that include three words relevant to the combatant. Series Fauxnale: For thirteen years, So Long, My Love was believed to be the last mainline Sakura Wars game ever made. Come Sega Fes 2018, however, and now we're getting Shin Sakura Wars. Schrödinger's Gun: The hooded girl who sacrifices herself in the flashback changes in appearance according to whose companion you choose. However, if you select Ratchet the hooded girl will always be Gemini. Shout-Out: The entirety of Cheiron's chapter seems to be an Affectionate Parody of the Ace Attorney franchise, with Shinjiro collecting clues during the first half of the day, and facing Cheiron in a trial in the second. For good measure, Cheiron can be later encountered in Central Park while she practices shouting out objections. Stealth Mentor: Sunnyside puts Shin through several difficult situations so that he can strengthen the bond with his teammates and become a worthy leader, going as far as to suggest sacrificing his companion to the Five-Ring Mandala. Gemini Sunrise is named after Gemini, the Twins. This becomes meaningful in Chapter 6. Cheiron Archer is named after a centaur of Greek mythology. Her Japanese name, Sagitta Weinberg, is derived from Sagittarius, the Hunter. Both names also make reference to archery, as Sagittarius is oft depicted as wielding a bow. Subaru Kujo is named after Taurus, the Bull. Rosita Aries is named after Aries, the Ram. Diana Caprice is named after Capricorn, the Goat. Ratchet Altair is named after a star in the Aquila constellation. Superpowered Evil Side: Nobunaga creates one of each member of the Star Division. Take Your Time: During side missions, the clock turns around and stops ticking, letting you visit many places multiple times without advancing the clock. Taken for Granite: The fate of many civilians (and most of the Star Division) in Subaru's chapter (they get better). Talking Is a Free Action: Place two characters next to each other in battles for a tidbit of flavor dialogue. All the segments in between missions give you limited time to make all preparations and complete the day's sidequests. Failing to achieve certain objectives or running late will lower your performance for the day. Many dialogue choices are timed as well. Not answering in time is considered a response in and of itself. In chapter 5, you have to destroy Enten's pneuma tank within five minutes before Diana, Cheiron and Rosita are transformed into stone. In chapter 7, if all of the generators aren't destroyed fast enough, the mooks will obliterate the theater's barrier. Time Skip: The game picks up one year after the events of Fall in Love, Maidens. Even though each chapter in the main storyline spans a few days, one month passes between each of them. Trailers Always Spoil: The promotional video trailer spoils Azuchi Castle's appearance and the Star Division's final battle with Nobunaga, namely the Ahab ramming into the castle, Ratchet covering for Shinjiro and the Star Division teaming up to form their most powerful maneuver. Transforming Mecha: The STARs can transform between robot and jet forms. Video Game Cruelty Potential: So many possibilities. You can invite the ill, vegetarian Diana to a dinner of fried chicken. You can yell at an emotionally-strained Rosita and threaten to kick her out of the team. You can make fun of Gemini's attempts to join the Star Division and mock her father figure for being a pervert. You can utterly ruin the Division's Christmas party. This will, however, make progressing in the game almost impossible, closing off most sidequests and weakening your characters significantly. Weapon of Choice: Each character's STAR is equipped with a scaled-up version of weapons they would use on-foot: The Hero Shinjiro dual-wields katanas, Occidental Otaku Gemini uses a single katana, reformed Badass Biker Cheiron uses a chain, Yamato Nadeshiko Subaru uses fans, Bounty Hunter Rosita dual-wields pistols, Combat Medic Diana uses syringe-shaped water cannons, and the side-lined Ratchet uses throwing daggers. If Shinjiro's Star is destroyed, it will result in an immediate Game Over and force you to restart the battle. Justified in the story towards the final chapter: with Shinjiro in a coma, the rest of the Star Division doesn't have the coordination and willpower to fight anymore, letting the Dark Pneuma robots advance all the way to the HQ.